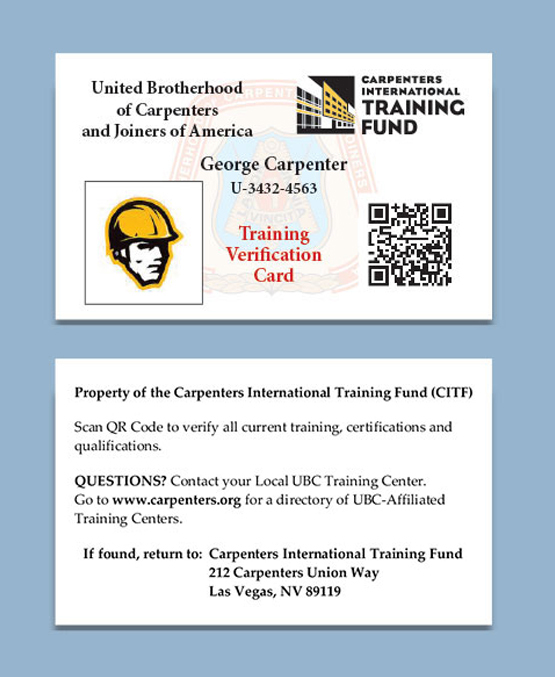 The UBC’s Carpenters International Training Fund (CITF) provides real-time training, certification and qualification reports for UBC members through Training Verification Cards. The Training Verification Cards (TVC) help UBC members track their current training and stay eligible for future training. The individual, wallet-sized card includes a QR code which, when scanned, displays verification for each member’s training, certifications and skills qualifications. The TVC also displays the member’s name, UBC ID number, local union, craft, classification (journeyman, apprentice), status and paid through date.